When I'm contacted by an modern American rock or metal band for review, I normally cringe. Constant readers know that we're rather large skeptics of what passes for mainstream American rock and metal. The former believe they are less sellouts than Hinder or Nickelback. The latter think they are more novel and certainly more contrasting than all metal combined. Both think they're not reinventing the wheel. Then there are those from California: ever since Haight-Ashbury, Jane Fonda and Jerry Brown, they all think that everything from Napa Valley to East LA to the Santa Ana winds gives them special inspiration. (And if you're not catching the sarcasm now, quit reading.) Then along comes a band like Eken Is Dead who, like their notable cohorts Canobliss, are both highly talented and severely unrecognized (except maybe in their corner of the globe). First, I'll get the bad news off my chest about the things that really put me off. There's too much screamo vocals and too little serious fret work on 'Amendment' to please me. Generally, Navarrette is clean and clear for a start, but then drifts to the severe, bent to the ground, microphone in the esophagus screaming on most songs. On the last three songs, he's like a man having his toenails pulled out by Osama Bin Laden's henchmen. I only wanted to turn him off so I could hear the good stuff, the music (I could have easily stopped after 'The Glue'). Also, though there's generous and meticulous riffing on 'Amendment,' I didn't hear an identifiable and vibrant guitar solo until the fifth song, 'Affliction' (very good; the solo that is, not the lack of them). Unfortunately, these aforementioned things are part and parcel of what is the essence, and major selling points, of current American modern rock. Now, the very good news: though mostly following modern American trends, Eken Is Dead delivers some true inspiration in their song composition turning those same trends on their heads. Throughout 'Amendment' there is a healthy undercurrent of fusion as Eken expertly and deftly blends hard rock, heavy metal, groove metal, and very subtle, some jazz notions. Two standouts that come to mind are 'Falls' and ambitious and outstanding 'The Glue.' With the exception of the mundane screamo/metalcore pieces 'Amendment' and 'Shackled,' this thread is tightly woven within this disc. Even with my earlier remarks, when Navarrette isn't tanning the leather of his lungs, his vocals are both stirring and sublime. And Arevalo has some fine licks sounding more than inspired on 'Affliction' and 'Falls.' But he still needs more of a presence, much more. As for the rhythm section, Almanza has a solid and sweet touch on bass and drummer Espinoza plays with clarity and passion. 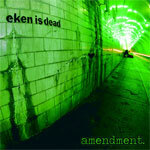 Even though modern American rock still annoys and befuddles my sensibilities, Eken Is Dead and their fine work, 'Amendment,' gives cause to be encouraged. Their talent and strength is in their provocative and eclectic fusion of rock and metal which easily and thankfully overturns any mundane modern music undercurrents they may have.